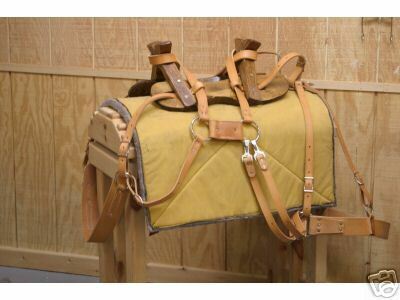 This is our Economy Sawbuck Pack Saddle. It is made with 12-14 oz. oiled skirting leather all around. We oil the leather several times to soften it. The breast collar and breeching are 2 � inches wide and not lined. We use Conway buckles instead of roller buckles for adjustment. The forks on the saddle are made of 1-3/4 inch Oregon oak. Sideboards are pine wood because of its light weight and resistance to cracking. 1-1/4 inch strap slots are provided for rigging. The tree bars measure 21 inches. No screws are used on the tree. The Pack Saddle comes with a cinch. Please specify size when you order. Thanks for looking.